Pacific Northwest Friends of FSH Research: Shouldn't it be Karaoke for Everyone? "....I also know the city, have you ever wondered why all the real interesting shops or bars seem to be down or upstairs. Why is this? This not a complaint, or maybe it should be. I was going to take up a karaoke singing career, but they all downstairs in the city. In hindsight this could be a good thing for the rest of you as I cannot not sing. Yet what if you are a good singer and use a wheelchair, shouldn't it be karaoke for everyone?" Monica Ellis s hares with us her view of the world, written with humor & insight. Monica was born in Canada in 1975 and moved to Australia at the age of three, Monica has FSH Muscular Dystrophy. "The thing I fear most in this life is talking about me. I would rather hide under my bed. But nothing exciting ever resulted from hiding under beds—that’s if you exclude people who like talking to spiders. And as I am so very afraid of spiders, particularly the hairy ones, I think I will talk about me, my art and my dog, Molly. I will also tell you about a girl named Silly who dropped by one afternoon quite unannounced for a cup of tea and began sharing her adventures. I started drawing at a young age. Like many other little girls I had an obsession with princess’s in fluffy ball gowns who lived in far away castles. I drew thousands of pictures of them and decided that when I grew up I would like that sort of life…and in particular, those sorts of clothes! The other option was to be a ballet dancer (those great tutus). For me any role in life was always about what you got to wear. To be truthful nothing much has changed except the realisation that I was not born into royalty and so the princess life was out. (In hindsight I am very, very glad) Alas, ballet was out as well. I was diagnosed with muscular dystrophy when I was five and that put an end to a career in dance. It is a condition that eventually led to life in a wheelchair. But through my drawing I could be any of these things I had once dreamed of being, and travel anywhere on the globe.I was only limited by my imagination...."
Read more of Monica's writings and see her artwork at the redbubble.com site. 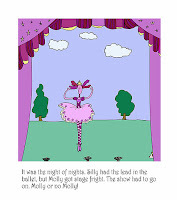 Monica has her artwork available for purchase as well - check out her many fun cards that feature her character Silly. Also, see her fun website too!